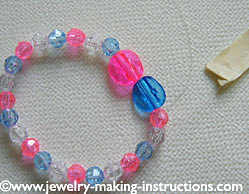 Organizing jewelry making parties for children is fun and all kids love to make jewelries together. Just recently, I organised one for my niece's 10th birthday. The girls ranging from age 5 to 10 just love it. Child jewelry should be light and colorful. For my niece's birthday party, I used colorful plastic beads and jewelry making elastic strings. 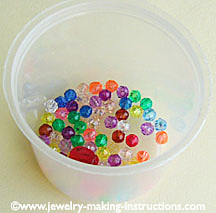 It is important that the beads shouldn't be too small and the beads holes big enough for the children to string easily. Important: Children below 3 years old should not be included when organising jewelry making parties for children since small plastic materials for jewelry making are used. 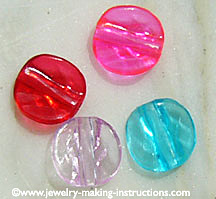 If it's a big jewelry making party for lots of kids, then all jewelry making materials for each child should be packed into ziplock bags before the party. The above bracelets were created by the girls during my niece's birthday party. They were simple to make but beautiful to look at. (To view a bigger image of the colourful bracelets, just click on the image and you will be able to view a gallery of images on this page). 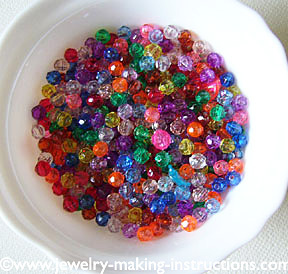 Pour all the plastic beads in big plastic bowls. Distribute small plastic cups to the girls. Explain to them that they will be making a colorful bracelet for themselves. 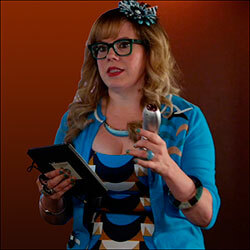 They are to choose their own beads and arrange the colors according to their own desires. Cut the elastic strings to about 8 to 9 inches long. Give each girl a piece of the elastic string and tell them to pick about 25 8mm plastic beads and 2 14mm beads from the big bowls. When they have finished stringing the beads, take the stringed beads from them one at a time. Do not cut off the tape. Take the two ends of the string and tie two or three knots. Put on the bracelet for each girl. Individual tub for each child with all the supplies needed to make a bracelet. The children, both boy and girls, were captivated by the bright sparkling colour of these candy beads. It's likely that they will want to grab a handful of these for themselves the moment they see these plastic beads. Add a few unique shape beads for interest. Get parents or friends to help with the elastic strings. Isn't this lovely! 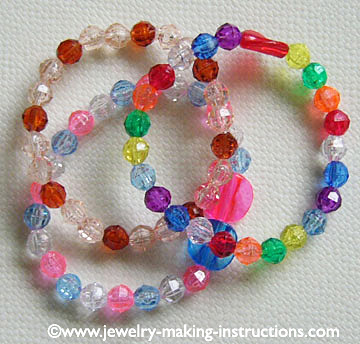 Children just love them so when your child's next birthday, have a jewelry making session also. Actually, you don't need to wait for a birthday, have one any time during the school holiday.